Health Sciences & Human Services Library </p? Health literacy is becoming a vital issue at both the societal and medical professional level. 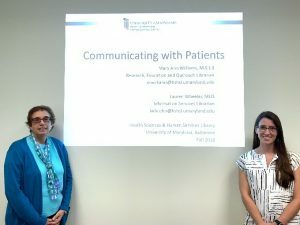 The Health Sciences and Human Services Library at the University of Maryland, Baltimore offers a Communicating with Patients workshop to help those in medical professions learn effective ways to communicate with their patients. The workshop begins by raising the participants’ awareness of the low health literacy rates in the United States as well as in Baltimore. Confronted with the realization of these rates, health professionals immediately see the need to improve their verbal and written communication with their patients. Defining health literacy at the beginning of the workshop has been a great strategy to engage participants. We explain that health literacy is the ability to read, understand, and act on health information. The emphasis of this definition is placed on the ability of the patient to deal with the information the healthcare provider is giving them. However, it is the responsibility of the healthcare professional to provide health information that is understandable to the patient. During the workshop, we highlight several areas where clear health communication is lacking within the healthcare setting. These areas include the language used on prescription container labels, maps, schedules and instructions posted in healthcare setting, as well as the use of unfamiliar phrases, symbols and abbreviations. Many of these things have a high literacy demand and are discouraging to patients. Our workshop brings awareness to these areas then gives suggestions for clearer communication. While most health-related materials are written at a high school reading level, the average adult reads at a middle school level. This statistic is often shocking to the workshop participants. It helps them see the importance of health literacy. To combat the differences between health materials and average reading levels, the workshop presents simple changes the health professional can use when presenting information to the patient. We talk about using short sentences and bullet points to help focus readers. We also suggest against using polysyllabic words whenever possible. These longer medical terms can often be substituted with a shorter, easier to understand, term. For example, using blood infection instead of septicemia. One approach that often surprises our workshop participants is to use sans-serif fonts like Ariel instead of fonts with serifs, like Times New Roman. We also suggest clear ways to convey numerical concepts. These strategies include rounding decimals to the nearest whole number and using familiar analogies. Telling a patient to eat a serving of meat about the size of their palm paints a much different, and easier to understand, picture than just saying to eat a single serving of meat. Participants seem interested that such a simple change can make a difference in how a patient understands information. During the session, we encourage active participation by asking participants to share their experiences, or how they might use what we have discussed. An example of engaging the participants is used when explaining how clear health communication is done in active voice instead of passive voice; we ask participants to translate an example paragraph into active voice. Sometimes this is a strange concept to participants because they are used to writing for academic journals, which typically require the use of passive voice. Another way participation is encouraged during the workshop is by giving participants a few sentences that could be improved in several ways. We ask them to change these sentences to make them clearer, using the strategies talked about in the workshop. If any of the points are missed as participants discuss their changes, we go back and talk about them. To reinforce the points which were covered, we provide a lengthier sample of text with the Flesch-Kincaid Grade Level score and percentage of passive sentences. They work in Microsoft Word to lower both of these numbers. Oftentimes, there is a “lightbulb moment” where the workshop participants realize that translating medical text is more difficult than they originally thought. Using this exercise makes the lecture more relatable and participants can quantifiably see how the changes they make to a passage affect health literacy. The Communicating with Patients workshop is very popular. Health providers often see the need to communicate clearly with patients, they just need a little instruction on how to achieve this. From the follow-up survey, we believe workshop participants are happy with the strategies taught in the workshop and, from their comments, hope they are using a few of them in their everyday practice.